Tri-Seal, Triton’s liquid applied damproofing and waterproofing system, was specified as a guaranteed method of waterproofing to protect the servers in two major new data centres. The servers will be located at ground floor level within the converted facilities. 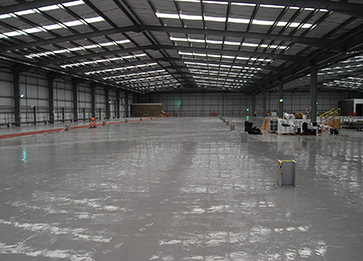 A total of 19,500m2 of Tri-Seal has been applied over the concrete floor slabs constructed at first floor level. To indicate walkways red Tri-Seal was applied, incorporating a fine aggregrate to produce a non-slip surface. All concrete surfaces were cleaned, ensuring all joints and cracks had been filled with Triton Fillet Seal. In bunded areas, Triton Fillet Seal was also used at the junction between the floor slab and the bund walls. Following preparation of the surface Tri-Seal was applied in a two coat application at a rate of 4m2/kg for the first coat and 5m2/kg for the second coat giving a total film thickness of 400 microns. The coverage rate of the first coat can vary from the above depending on the porosity of the surface to which is applied. Tri-Seal can be recoated approximately six to eight hours after the first coat application and is touch dry in approximately four to six hours. It is fully cured after seven days. Where Tri-Seal is applied to bunded areas beneath raised access floors to prevent downward moisture ingress, drainage access points are either incorporated into the floor or the water is retained until it can be pumped out. Tri-Seal is a solvent free, two part epoxy resin formulation, which can be used in a variety of applications. In addition to application in bunded situations, it is also suitable for application on damp surfaces such as sand/cement and concrete floors subject to rising damp or containing residual construction moisture. The cured product provides a flexible, but tough barrier suitable for foot or light wheeled traffic. It can be screeded or blinded with course aggregate as a key for renders, bonded screeds or tiles or with fine aggregate as a slip resistant finish.